Recently I reported on the first known loss of a Kador Skinned Avatar which was destroyed by members of the #REKKINGRUSKI gang of LowSechnaya Sholupen [-LSH-]. This gang primarily operates in the Aridia region of New Eden, unlike the well known #REKKINGCREW gang lead by RoCkEt X of Pandemic Legion [-10.0] who have earned their fame for their work in the Derelik region. 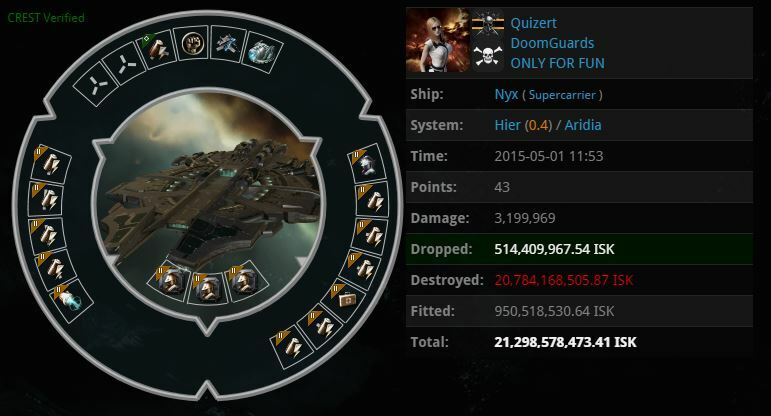 The #REKKINGRUSKI gang has slowly began to increase its Super Capital kill count following the exodus from southern Null Sec space of the many sovereignty holding entities, who are doing so prior to the so called “FozzieSov” changes due in June. 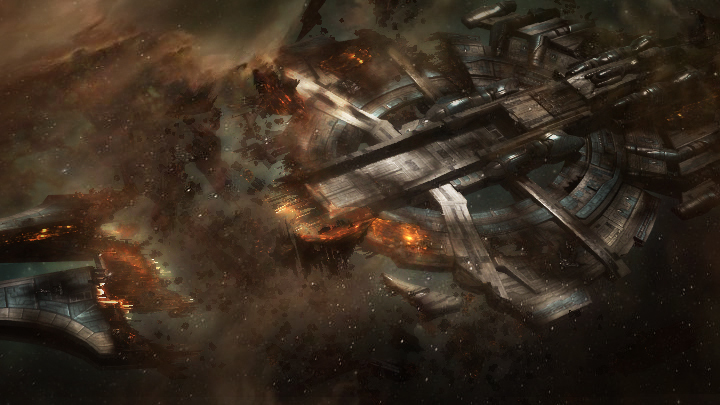 This article is based on their latest kill of a Nyx class Super Carrier, piloted by Quizert of the DoomGuards [DOOMG] Corporation who are members of the ONLY FOR FUN [OFF] Alliance. The pilot was caught in the Hier system of Aridia whilst in a mostly capacitor based fitting, which used to be the well known travel fit of Super Capitals prior to the the jump mechanic changes in the Phoebe patch. The other day we were waiting for 2 Super capitals to move and we knew the system they where in and also the direction they wanted to travel. So we set eyes on our targets and waited for things to happen. So I made best speed to Hier and warped to the cyno at 10km. As the cyno was already burning for some minutes I thought that what ever came through it already flew to a safespot or is cloaked and slow-boating into random direction. But Eve is like a box of chocolate, you never know what you´re gonna get! A Nyx jumped in and landed 5000m besides me, and I was lucky not to get decloaked. I yelled for HIC´s and told our prober exactly where the Nyx aligned to and warped. We got his spot and was able to decloak him on his safespot. The rest is in the history Books. As stated above, you never know what you’re going to get with EVE. Clearly it just so happened that even though they were waiting for another mark, this one appeared as a target of opportunity. The pilot was likely completely unaware that he was jumping into the trap, though laid for someone else, but deadly nonetheless. Regardless, the Nyx pilot should have been more careful in his travels. Usually when a cyno is up in space the pilot would jump soon after, especially if local is clear, to reduce the risk of getting caught. However, this time the pilot, for an unknown reason, chose to jump to the cyno after leaving it in space long enough for someone to be waiting to catch it. I have contacted the pilot of the Nyx but have had no response at the time of writing. If I receive a reply I will be update the post accordingly. Wow! Thank you! I permanently needed to write on my site something like that. Can I include a portion of your post to my site? I as well as my pals came studying the great tips and hints on your web blog and at once I got an awful feeling I never expressed respect to you for them. My men were definitely so joyful to read through all of them and have in effect in actuality been enjoying these things. Many thanks for indeed being indeed thoughtful as well as for pick out these kinds of tremendous resources millions of individuals are really needing to be aware of. Our honest regret for not saying thanks to sooner. I’m producing a brand-new blog site concerning literature (what I have actually read, what I read), however I’m having problem thinking of a title. I like the idea of something involving an obsession with literary works yet I think bookophilia is on the average side. What do you consider Litophilia? Is it as well comparable to “lithophilia” Which suggests the love of stones? Any kind of ideas? Many thanks!. Nice post. Thanks for sharing this exciting post with us. I enjoy at the time of reading this post. You have done a awesome job by sharing this post with us. Keep it up. Leave a Reply to commercial electricians perth Click here to cancel reply.